"The Shield & the Claw"
So put on your slouch hat and grab your twin .45 automatics; there are werewolves and monsters awaiting to challenge the most macabre hero of them all: Brother Bones! I am never really sure how to take Brother Bones. He is a guy that was a real jerk while he was alove, and now he has to make amends for the way he lived by becoming an undead avenger, who basically whacks guys who are like he used to be. To me, that isn't much of a puinishment. I mean, he is essentially immortal, and gets to cap crooks whenever he can. Doesn't sound to bad to me. In fact, I find this series fun as H E double hockey sticks. I just love it. So, I don't really feel all to bad for the grim avenger of the underworld. One thing I would really like to see, is some Lovecraftian (overtly done) influence added to the mix. It really worked in the Green Lama series, and it would just be perfect for someone who is undead to confront. Could it free him of his obligation? Could it enslave him? It seems there are some real possibilities here that need to be explored. There are six stories compiled here. They can be listened to in any order, but I think the first tale should be what you start with, after that it is dealers choice. I generally go all the way straight through from start ot finish. These are good solid stories, and they only enhance the Brother Bones mythos, although I do hope the next book will be a full on novel. Bennett is a master at narrating noirish pulp tales, and his voice carries you back to yesteryear, while simultaneously keeping you rooted right here in the present. He really adds to the whole ambience of the stories with his intonations and timbor. I think he could have really nailed it as a radio host back in the 40's. He'd have put on one heck of a show. This is the third book in the series. If you missed the first two go get them now, you are seriously missing out on some great stuff. Or just get this one for now, it could be used to get you hooked. Just don't miss out on all the fun. Pulp Power!!!! Seels like the old Phantom Radio serials. This story read like an old school radio serial, which was kind of cool. The pulp feel of the story brings a good feeling of nostalgia, with some interesting characters, some over the top villains that you'll enjoy booing, and a fast paced plot that will keep you listening. J. Scott Bennett really hit the nail voicing the characters, keeping the story moving along, never settling into a monotone. If your looking for a retro kind of action tale, you could do worse than this one. I was given a copy of this book free of charge in exchange for an honest review through AudiobookBlast. This is the type of horror that will speak to your silly side. These stories are more sci-fi than horror in my opinion, but they were fun nonetheless. If you like your horror with a serious dose of fantasy than you will love this book!! Some stories are better than others. Overall I enjoyed the stories. The narrator did a good job. I received this audiobook for free through Audiobook Boom for my unbiased review. Would you listen to Brother Bones: The Undead Avenger again? Why? Who was the most memorable character of Brother Bones: The Undead Avenger and why? 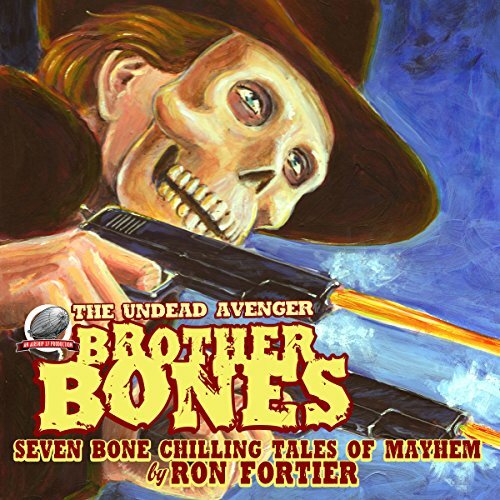 What did you love best about Brother Bones: The Undead Avenger? I loved its joy in grit and gore. It splashed all over the comic book in my mind. The choice of vocabulary and action was pulp-perfect. What other book might you compare Brother Bones: The Undead Avenger to and why? It reminded me a little of Lovecraft, a little of some of the 1930s-style Weird Tales, with a little Al Capone thrown in. What does J. Scott Bennett bring to the story that you wouldn’t experience if you just read the book? His narration was great for this genre. He grates really well. As soon as I started listening to the Audible version of this book, I was instantly excited. I recognized the voice of J. Scott Bennett (who I fell in love with as a narrator after listening to Jake Bible's "Fighting Iron") and I was not disappointed with his performance of "Brother Bones." I guess this book would be considered Noir Pulp Horror, and this is not a genre I have read before, or had any desire to before. I have to say, though, that I really enjoyed this book. It is exciting, gritty, and fun. The setting, Cape Noir, reminds me of the movie, Sin City. If you enjoy this genre or are even considering branching out and trying something new, I would recommend this book. I definitely want to check out more books by this author, especially if narrated by J. Scott Bennett. I have never read Mr. Fortier before. I’ve never read pulp horror before. In fact, the only familiar thing about this is the narrator. I don’t know if he chooses these types of books because he likes them or if someone’s heard him before and just knows he’s the right narrator. Whatever the case, he is the right narrator for the dark and deranged. Having opened myself up to new writers, new genres, I have frequently been disappointed by books that feel like they are merely the second draft on the road to something great, but someone (author, editor, publisher, etc.) decided that they wanted it out to the public before the story percolated into something avid readers would really appreciate. This set of stories is definitely not one of them. This set of stories is thick enough to sink your teeth into and dark enough to blind you to anything else until you’ve finished it in its entirety. Although for some looking for the cozy weirdness, you may have to pass this one by. It has gore. It has weird. It has shock factor. But all of that is the seasoning on top of a well-cooked steak. First things first, the narrator does a great job! He performs mentally unstable characters very well (that’s meant as a compliment…). I really enjoyed all of the stories, but my favourite was “The Root of Evil.” They are short enough that you don’t get bored, but long enough to keep you satisfied and for them to not feel rushed. Purchase this book and enjoy.